Eurasia Group, reputed as the world’s largest political-risk consultancy, says President Muhammadu Buhari will win the February 16 presidential election. In its final Eurasia Group Politics First election forecast seen by TheCable, the group, which was founded in 1998 by American political scientist Ian Bremmer, said Buhari has a 60 percent probability to win. “Opposition candidate Atiku Abubakar has regained some momentum in recent weeks, but President Muhammadu Buhari remains favored to win (a 60% probability),” the group said. In 2015, Eurasia Group tipped Buhari to defeat former president Goodluck Jonathan , changing its stance some weeks to the election, after it had initially chosen the former president to win. At the time, the group said although it initially tipped “President Goodluck Jonathan for re-election, a number of factors had since changed, and the pendulum had swung to the Buhari’s side”. The group said the decision of President Muhammadu Buhari to suspend Walter Onnoghen, the embattled Chief Justice of Nigeria, will not affect the elections. “Positive news coverage in recent weeks, along with Buhari’s controversial move to suspend Chief Justice Walter Onnoghen over allegations of corruption, have boosted Atiku’s campaign, but it is too late to change the electoral dynamics and Buhari remains favored to win on 16 February,” the group said. “As we have previously noted, key actors in Atiku’s camp—including his campaign’s director general Bukola Saraki, key powerbroker Governor Nyesom Wike of the oil-rich Rivers state, and southeast governors from his People’s Democratic Party (PDP)—had been disengaged from his election campaign”. The group added that Atiku’s big players have been disengaged from his political campaign, adding that governors of the Peoples Democratic Party (PDP) will be fighting to ensure they win their own elections. “Wike was annoyed by Atiku’s failure to consult him on key decisions, Saraki remains distracted by a tough Senate reelection battle in Kwara state, and the southeast governors are hampered by many conflicting motivations, including their own lack of political clout (which makes them reluctant to overtly challenge the federal government) and their wariness of Atiku’s running mate Peter Obi, a former governor of the southeastern Anambra state who they view as a political outsider. The group concluded by saying “Atiku’s voters do not match Buhari’s in passion and are unlikely to risk their lives on the streets for him”. “Though Buhari’s decision to suspend the chief justice triggered widespread criticism and stoked passions (along with fears about a more autocratic Buhari second term), many voters blame the judiciary for not moving quicker to force Onnoghen’s resignation after he admitted he had violated rules regarding declaration of assets. 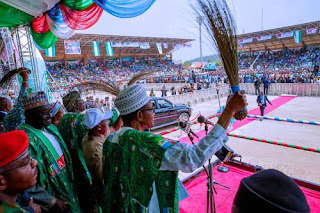 A few weeks ago, Eurasia Group said Buhari will continue as a politically weak president , while Atiku may retract his pledge made during campaign season.